Automatic tolerance control with MPN network system. Compatible with most existing piezo electric CFM sensors. Easy and inexpensive to upgrade or replace old CFM's. The reliability of automobiles, home appliances, medical devices, airplanes, missile defense systems, satellites, etc. all depend on reliable wire harnesses, more specifically good crimps. Crimp Force Monitors (CFM's) have been employed in most crimping departments to provide 100% on-line inspection of crimps for over 20 years. 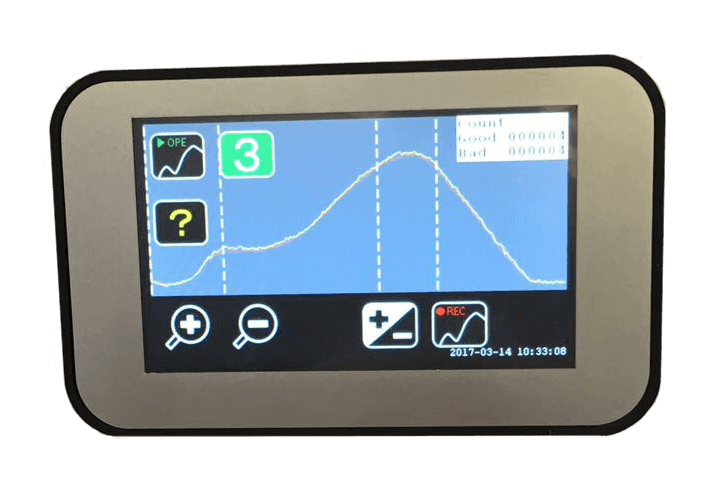 CFM-Lite is our latest model single channel crimp Force Monitor (CFM). It is the culmination of over 20 years experience with CFM's and over 10,000 units installed worldwide. It offers low cost simple to use defect detection for your manual crimp presses. A piezo electric force sensor is installed on the crimp press. It can be a "ring" sensor installed in the base plate or ram adapter. Or it can be a sensor mounted to the crimp press frame. When the setup work finished and a proper setup validation completed the operator performs a teach-in. During teach-in CFM-Lite "learns" the shape of the normal crimp force curve. During production the shape of every crimp force curve is compared to the "learned" reference. If any changes in the force curve shape are detected an alarm is given. The foot switch is disabled. Many advances have been made in networking the CFM's to create very robust crimp process control systems including materials verification with a barcode scanner, setup validation with crimp height micrometer and pull tester, applicator shot count to monitor tool life, etc.